As promised, here is one of the recipes I tried from Annabel Karmel’s new book, ‘Quick and Easy Toddler Recipes’, which I reviewed in a previous post and which is out today. I’ll definitely be making this again. It’s very quick (under 10 minutes! ), very tasty and perfect to make for the whole family. Even if your little one isn’t a huge fish fan, give this a try as the sweetness of the orange juice might change their minds. You could cut the fish into more manageable ‘fingers’, before dusting with flour, for little hands to feed themselves. Serve with a side salad for adults and some raw vegetable sticks for toddlers (prepare a stash of these to keep in the fridge for a few days to save you some time). Annabel’s recipe says two lemon sole fillets makes 1-2 portions which is confusing to me as the serving sizes throughout the book seem to be a toddler portion. For me, allow at least one fillet (one half of the fish) for each adult and 1/2-1 fillet for each child. You don’t just need to use lemon sole with this orange and soy sauce; any white fish (cod, plaice, haddock, etc) would go well with the sauce. Next time I’m going to try it with salmon chunks for Nicholas. 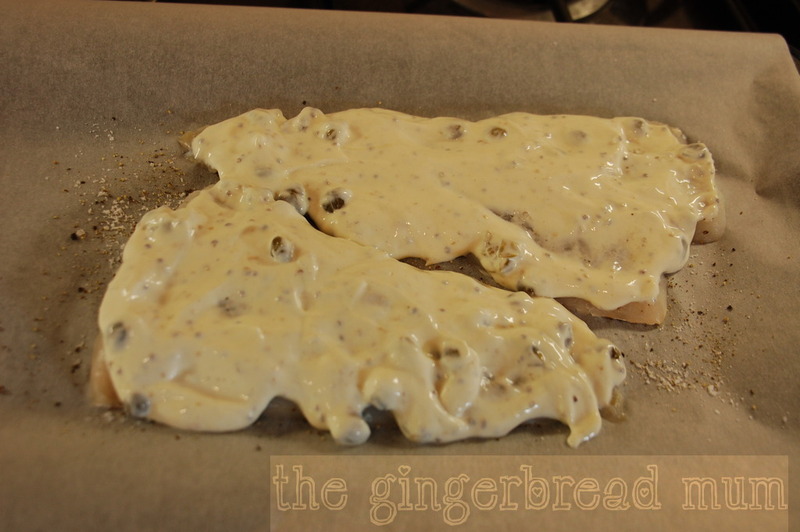 Season the fish fillets and coat them on both sides with the flour, shaking off any excess. Melt the butter in a frying pan until foaming, add the fish and fry for 1 and 1/2 minutes. Turn them over and fry for 1 minute more. 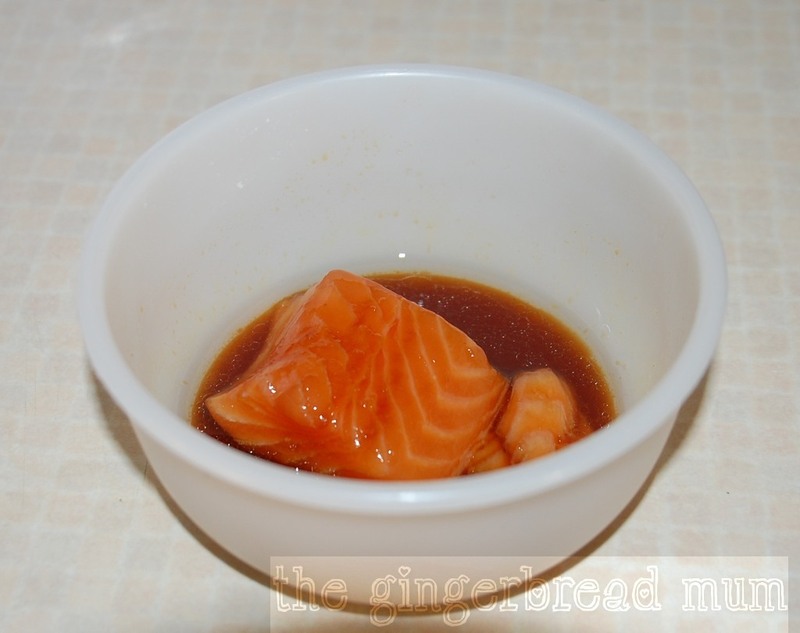 Mix the orange juice and soy sauce together, pour it over the fish and let the sauce bubble away for 30 seconds. Posted in dinner, family, lunch, recipe, toddler and tagged Annabel Karmel, dinner, family, fish, lemon sole, orange and soy sauce, Quick and Easy Toddler Recipes, recipe, toddler, whole family. Bookmark the permalink. I’ve realised living in the UK (just gone eight years now… wow how time flies) I crave comfort food. A lot. Food has always been something I turn to when I’m sad, depressed or even bored especially during the colder months, and the regular grey skies and drizzly days here really take their mental toll on hubby and me. Since moving to the UK from Italy we’ve both gotten fatter. Not good! So I’ve been on the search for low-calorie but tasty dinners. And they also need to be fairly quick and easy. This fish recipe has now become a favourite and tastes great (I don’t feel deprived at all!). The ‘secret’ is replacing the creme fraiche in the original recipe by Barefoot Contessa with low-fat creme fraiche. I don’t think anyone could taste the difference. Smothering the fish with the mustardy creme fraiche keeps the fish lovely and moist, and there’s less chance of it overcooking. 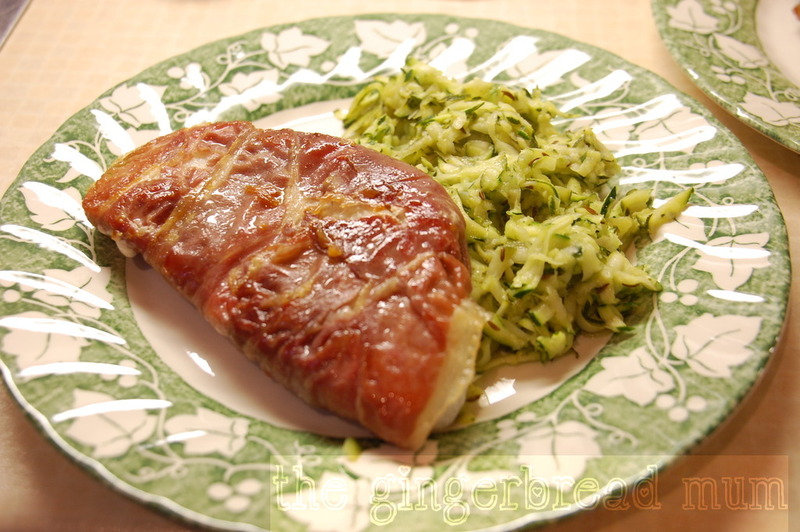 It goes great with the grated courgette/zucchini from this recipe (and it’s also low in calories). A perfect midweek meal that’s quick to make and tasty. Preheat oven to 200C. Line a baking tray or an ovenproof baking dish with baking paper. Sprinkle the baking paper with salt and pepper to season the underside of the fish. Place the fish fillet on the paper (skin side down if it still has skin). Season the top with salt and pepper. Put the creme fraiche in a small bowl and mix in the two mustards and the capers. Spoon the mustardy creme fraiche evenly over the fish, making sure to completely cover it. Bake for 10 minutes. Take it out of the oven and let sit for a couple of minutes. If you’re not sure if it’s cooked through, put a knife into a thick part and see if the flesh flakes. Serve with a green salad or stir fried grated courgette/zucchini. Do you have any low-fat yummy recipes to share? 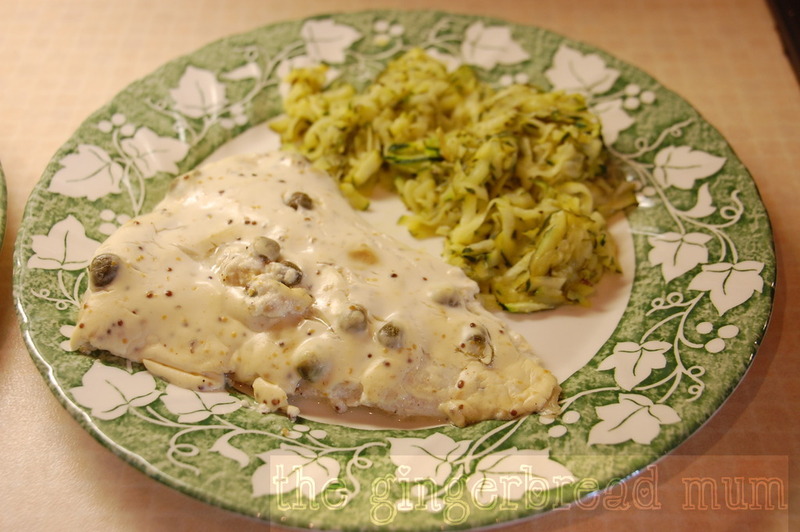 Posted in family, recipe and tagged Barefoot Contessa, cod, creme fraiche, family, fish, haddock, low-calorie, low-fat, low-fat creme fraiche, plaice, recipe, white fish, whole grain mustard. Bookmark the permalink. I’ve discovered that while Nicholas isn’t a big lover of fish, he usually happily eats salmon. Well it does have a meatier flavour and texture to white fish. 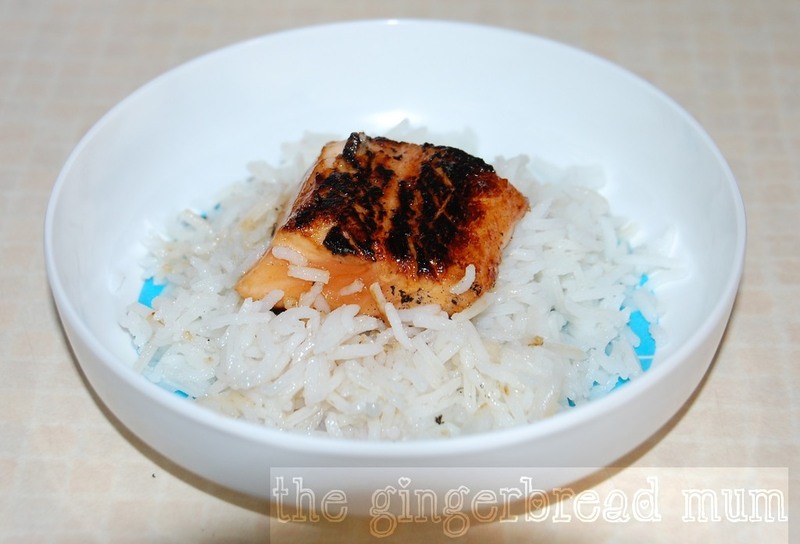 Maybe because of the sweetness from the honey in the marinade, this recipe is one of his favourite salmon dishes. Nicholas happily eats a 50g chunk of salmon, but if this seems too much for your munchkin a serving half this size will still give fabulous health benefits. I’m usually not organised enough to think ahead and marinate the salmon overnight. I tend to marinate it just for around 30 minutes while I’m doing something else in the kitchen and it still works out great. I have it marinating on the bench and when I remember I spoon the marinade over. This is definitely a meal you can do for the whole family without making any changes. All you need to remember to make more marinade is that there are equal portions of the three ingredients. Easy! Mix oil, soy sauce and honey in a small container. Put salmon in and spoon over the marinade. Cover and leave overnight in the fridge or leave to marinate for 30 mins spooning over the marinade a few times. Heat a small non-stick fry pan over a medium-low heat. As your piece of salmon is very small it will cook quite quickly. A minute or two on each side is plenty. The honey will caramelise and burn if the heat is up too high and if you cook it for too long, so keep an eye on it. Take the salmon out of the pan and let it rest for a couple of minutes (it will keep cooking in this time). Flake the salmon and check for bones. Serve with rice or noodles. Posted in dinner, family, lunch, recipe, toddler and tagged asian-style, dairy-free, dinner, family, fish, honey, light soy sauce, lunch, oil, recipe, rice, salmon, soy sauce, toddler. Bookmark the permalink.